There’s no better time for an Aussie road trip than the Christmas break. With summer in full swing, the warm, inviting weather is perfect for exploring our intriguing land. Whether you use your own vehicle or hire a car, you can plan a road trip for a weekend, a week or even longer. Stretching around 200 kilometres between Coffs Harbour and Armidale, this scenic drive crosses the Great Dividing Range and winds its way through some of the most attractive scenery in NSW. If you live in Brisbane, it’s not far away at all and provides a handy antidote to summer beach crowds and coastal humidity. The cool highlands of the New England Plateau offer a relaxing blend of rainforest, wineries, rural tranquillity, inviting towns and a surprising amount of well-above-average waterfalls along the way – many of which provide adjacent swimming holes where you can cool off and break up the journey. The lovely town of Dorrigo make a handy place to stop for the night: there are plenty of B&Bs and farm stays in the region to choose from. Beautiful walking tracks and peaceful picnic areas are found all along The Waterfall Way, so take your pick! If you want to escape the Victorian summer heat and fancy a drive on the highest sealed road in Australia (that’s accessible year-round), you should seriously consider a driving holiday along the mesmerising Great Alpine Road. Making its way from Wangaratta to Metung in the Gippsland Lakes region, it offers diverse landscapes that include high mountain ranges, densely forested valleys, rolling wine country and the aquatic holiday paradise of Gippsland, all packed into a single road trip. There’s so much to see in this area. Discover gold rush history in Beechworth while sampling some of best food and wine in the state. Use the small, welcoming town of Metung as a base to explore nearby beaches, lakes and water sports. If you want to do some hiking, the historic mining town of Omeo is an ideal place to take a break. It offers easy access to national parks and various alpine adventures. Feel your city cares drift away as you enjoy the alpine village of Dinner Plain, the scenic attractions of Bairnsdale and the fresh mountain air of Mount Hotham. The trick to making the most of this drive is to take your time and ensure plenty of stops along the way. Hit the tropics for some rainforest and reef action along this scenic coastal route, which runs between Cairns and Cape Tribulation. Following the Captain Cook Highway and Cape Tribulation Road, this journey can be accomplished with a hire car and is easily combined with a Green Island excursion, Daintree River Cruise, Atherton tableland exploration or relaxing stay in Port Douglas. The drive is only 140km in length, but there’s plenty to see and do along the way. 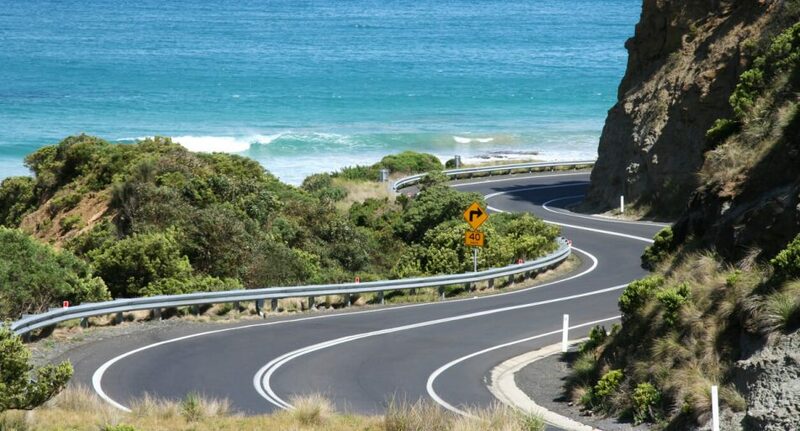 The road north of Cairns hugs the coast, providing splendid beach and rainforest views. Make sure you stop at Rex Lookout. Cane fields and green mountains beckon past Port Douglas, eventually bringing you to the Daintree River ferry crossing (no swimming here – the big crocs will enjoy it more than you will!). On the Daintree to Cape Trib section, keep your eyes open for cassowaries, which often make an appearance. At Cape Tribulation, immerse yourself in the laid-back jungle vibe or organise a quick eco-trip to a nearby reef. With around 16,000 kilometres of mostly sealed road to choose from and some of the most wildlife-rich and awe-inspiring scenery in the country, Kangaroo Island is practically tailor-made for a self-driving holiday. You can either bring your own car across on the SeaLink ferry or hire one when you get there; either way, you’ll find that driving is the perfect way to explore the island’s secluded beaches, friendly towns, critter-packed national parks and windswept cliff faces pounded by crashing waves. Give yourself anywhere from 3 days to a week or more and create your own itinerary. At this time of year, it’s best not to just ‘wing it’ when it comes to booking accommodation – make sure you’ve got somewhere to stay each night. Island highlights include the swimming-with-dolphins tour at Emu Bay, spectacular walking tracks in Flinders Chase National Park, the beautiful beach at Vivonne Bay and the Seal Bay Conservation Park, where you can get up close and personal with the local sea lion colony. Check out the Penneshaw Penguin Centre and the Kelly Hill Caves while you’re on the island as well – and don’t forget to sample some Kangaroo Island oysters before you go home! You can use our handy pit stop planner tool to help you create a rest-stop plan. When you’re done, export your plan to Google Maps for turn-by-turn directions. Roadside Assistance can be a big relief if you ever have a mechanical breakdown, need help changing a tyre, find yourself with a dead car battery or desperately need a tow.